Our very first Marketing Visionary is Divya Mulanjur, Head of Email and Content Marketing at Suiteness. Divya is responsible for everything from lifecycle messaging, to email marketing, as well as brand and content strategy. Without further ado, let's see how Divya makes marketing magic happen! SketchDeck: What’s the first thing you do when you come into work? Divya: Get coffee. Then, if it’s a Monday morning, I make a list of my goals for the week. No matter how long it takes, doing this at the start of every week helps me stay organized and focused. For the rest of the week, the first thing I do every day is list the top 3 things I have to get done that day. SketchDeck: As content and email marketer, what’s your email management strategy? Divya: Never leave an email without taking an action—reply, snooze, unsubscribe, delete, or label for future reference in case you need the contact. The two features I use heavily are labels and snooze! I dedicate a few minutes every 2 hours toward email. The last few minutes of my day are also dedicated to email so I don’t leave anything unanswered at the end of the day. There are of course days when I fall off the wagon and leave too many emails unread, which means once in a while I do a purge to get back on track. SketchDeck: So Divya, how many unread emails do you currently have? SketchDeck: What tools do you find indispensable for email marketing? SketchDeck: What email campaign(s) are you most proud of? Can you share the creative and explain the strategy behind them? Divya: I’m proud of an email we sent out recently that focuses on summer travel. Our suites are booked 30-60 days in advance so we try to get ahead of major holidays by sending out emails 2-3 months in advance. This email talks about options for a staycation for Memorial Day weekend. I love it because it is highly personalized—the suites featured are dynamically listed based on a user’s location. The email also has fallback options available if there are no suites in a user’s location. Plus the template is mobile-optimized. 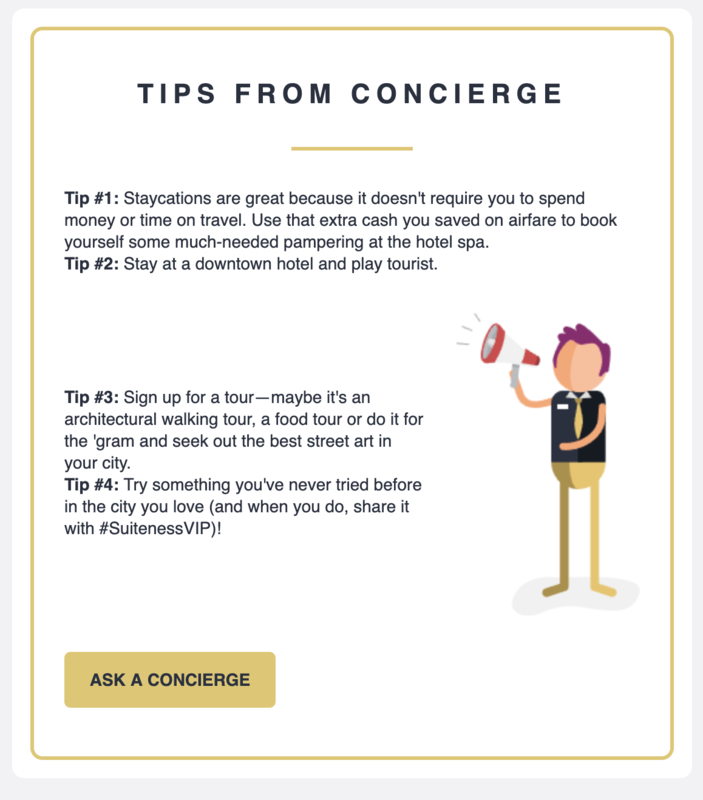 Another campaign that I love and is constantly featured in a lot of top marketing blogs is our welcome email. ‍The email welcomes a new member to Suiteness and lists important links, Suiteness membership benefits, and is such a beautifully designed email that has our branding all over it. I think it makes a good first impression and does a good job of introducing someone to the brand. In fact, this year we’re expanding it further and making the welcome series a 4-5 phase triggered campaign with almost 10 emails that will be sent based on actions taken by a user on a previous email. The goal is to introduce our value proposition to new members and show them relevant content based on the kind of trip they’re planning. SketchDeck: Have your email campaigns won any awards or been featured in publications? SketchDeck: How does SketchDeck help you and your team at Suiteness? Divya: Sketchdeck is an extension of our marketing team. We’re a lean marketing team with just 1 person managing our email marketing, which is, and I quote our founder, “the best tool in our marketing toolbox.” That wouldn’t be possible without Sketchdeck helping us with designing and building out our beautiful email templates. In fact, most of our marketing collateral is designed by Sketchdeck. I love that the team is able to deliver high-quality work every time with quick turnarounds and minimal input. SketchDeck: As an extremely busy marketer at a startup, how do you find a work/life balance? Divya: Personally, that’s easy because I work for a company where work/life balance is truly a core value. I work remotely so I have the flexibility to work on my own time and to travel wherever and whenever I want. That’s a huge thing for me since my husband and I love to travel. We take vacation planning very seriously and plan it months in advance! Our thing is taking road trips—at least once a year. In the last 4 years, I've been to 28 states and 11 national parks. 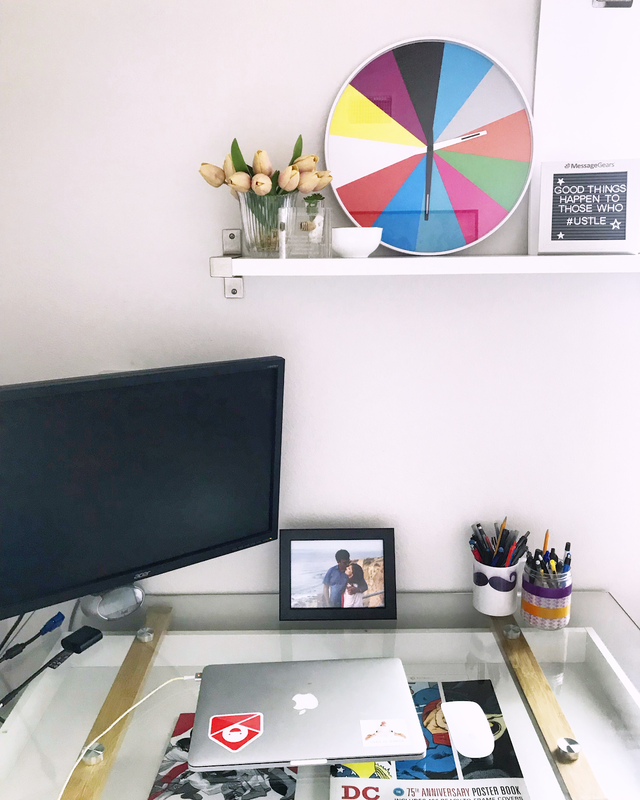 With remote work, I find that it’s important to differentiate between work and life. So some days I work from a coworking space. Days that I work from home, I try to work from my designated home office space so I can leave from work. SketchDeck: Do you have a marketing hack you can share with your fellow marketers? Divya: Chart out the lifecycle journey of the customer so you know how and when to retarget them with the most relevant message. This was the best thing I did for our email marketing program which I then used for social ads, SMS and in-app messaging as well. I’m also trying to shift our email communications to be more visual and less text heavy. We’ve been reaching out to social influencers to borrow their beautiful photos, with attribution, to help supplement our image library. SketchDeck: What’s the best advice you ever received? Divya: The best advice I received was to not apologize for having a point of view. For so many of us, ‘sorry’ has become a filler word or a default phrase so as to not offend, even when we have no reason to. I stopped saying ‘I’m sorry’ all the time and it has worked wonders for my confidence. SketchDeck: What is your biggest marketing challenge this year? Divya: I think the biggest challenge for Suiteness is the word ‘suite’ Most people hear it and think that it’s way too expensive and not for them. That’s the challenge and biggest focus for the marketing team this year—to show people planning to travel with friends and families that connecting suites (suites that connect to rooms with a separate door) are actually an affordable, and far more convenient solution when compared to vacation rentals or booking multiple hotel rooms. We have several initiatives in the works for this including and not limited to working with The Onion to produce video content to tell our story more broadly, a referral program, and more segmented welcome series to educate members about the brand. SketchDeck: What’s the last thing you do before you leave work? Divya: Make sure I don’t have any unattended emails or pings. SketchDeck: What are 3 apps you recommend to friends? SketchDeck: What does your workspace setup look like? Divya: This is my home office. There’s a message board that right now is reminding me that the hustle will always take me places. A Batman v Superman comic from Alamo Drafthouse that I occasionally use as a mousepad. My work laptop with my Really Good Emails and Women of Email stickers. And a photo to remind me of what’s most important in life.